Whoever you are, whatever you do, wherever you are in life, all of us at Robinson Chapel want you to know that you have friends here. Join us for a day or for a lifetime. Call first or just stop in. Know that you are always welcome. 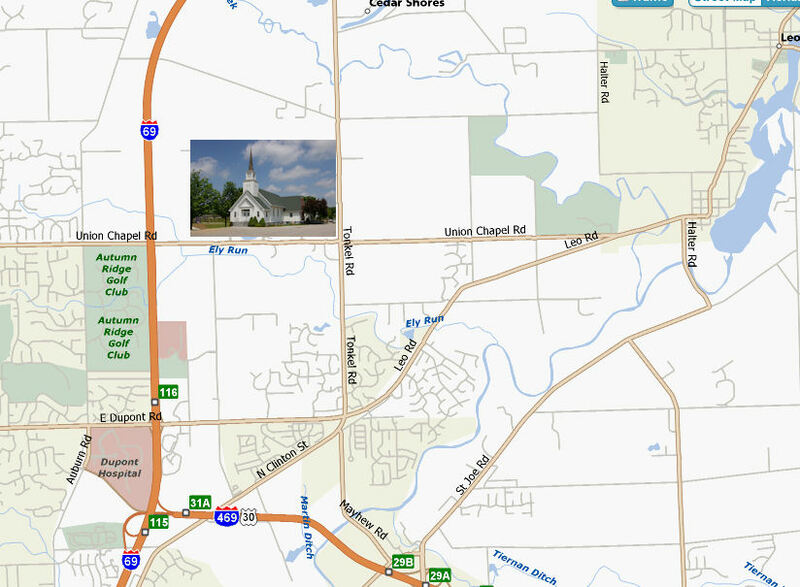 Robinson Chapel is located at the NW corner of Tonkel and Union Chapel Roads on the extreme North Side of Fort Wayne. By Interstate: Take I69 to exit 116 (Dupont Road). Travel east on Dupont Rd. for 1.4 miles until you reach Tonkel Road. Turn left (north) on Tonkel Road and again travel 1.4 miles. Robinson Chapel is on the left-side corner.